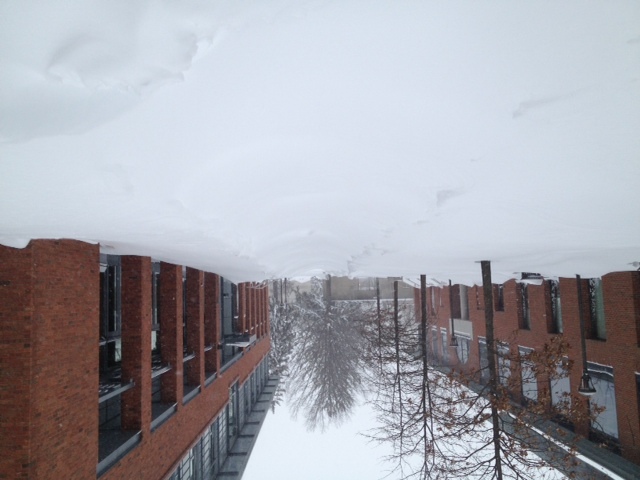 Despite the heroic efforts of our Physical Plant and Stonehedge, we have decided to cancel classes for the day. I am hopeful that enough classroom buildings will be fully accessible so that we can get underway tomorrow (Tuesday). We will make another announcement at around 6 pm this evening. 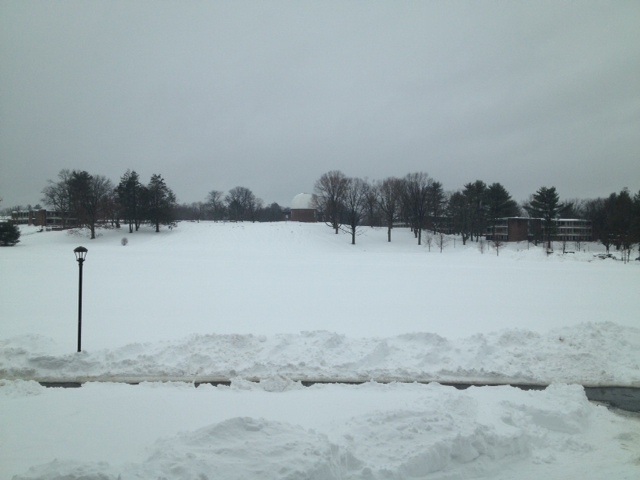 Wesleyan is closed Monday, and classes will not be held this afternoon. 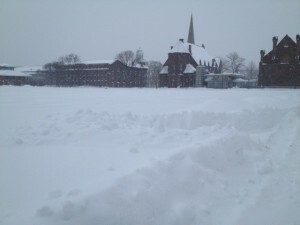 Parking on campus remains limited, and a number of buildings are not yet accessible. Only essential personnel should report to work today. 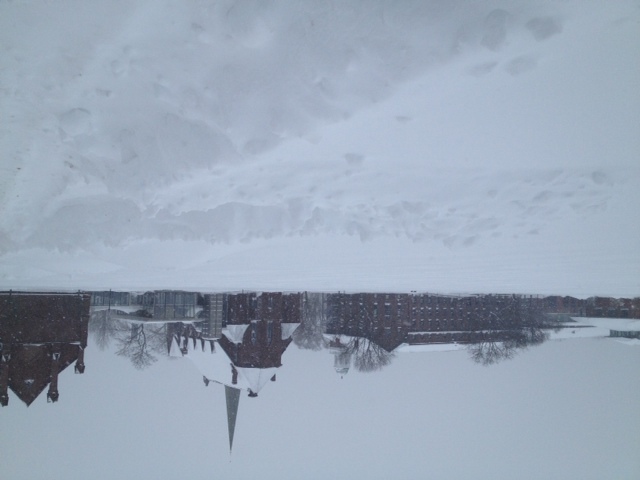 We are hopeful that classes will be held tomorrow, but that depends on how much snow removal gets done today. Our crews are working tirelessly, and we are very grateful for their dedication and good work. We will provide an update this evening around 6 pm. Heavy equipment is in use, so students should continue to exercise considerable caution outdoors. Call Public Safety for help with storm-related matters, (860) 685-2345. For emergencies, call (860) 685-3333. More than two feet of snow fell overnight, and it was a quiet, beautiful day when Kari and I got out of the house with Mathilde this morning. 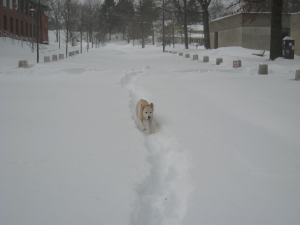 The path around Usdan was cleared already, and we talked with a Bon Appetit employee who walked miles (!!) through the snow to come into work. I am so grateful to the folks from Stonehedge Landscaping, Bon Appetit, and from our Public Safety and Physical Plant crews who are working through the storm to keep us safe and fed. 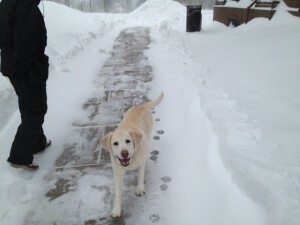 Thanks for posting these awesome pictures of the college and Mathilde. From your online student in California’s central valley, where we’ve had dry, sunny weather for a month. Love your video lectures, am deep into reading Rousseau. 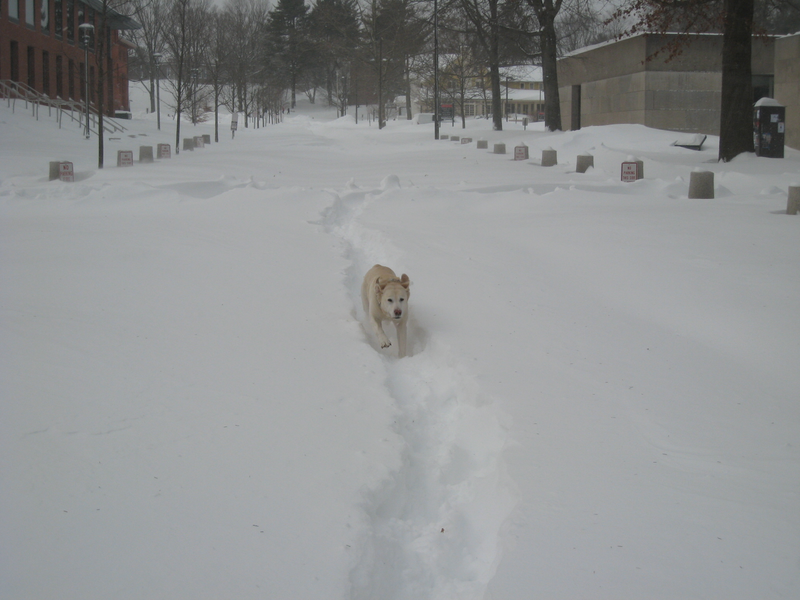 Excellent post-blizzard captures, Mike,…thank you for sharing! I live in a tropical country, beach and hot weather, we have harsh winters in the south, but nothing that compares to the climate of your country, which by the way enchants me, the snow can bring disasters, but it is beautiful. Thanks for posting these wonderful picktures. They are wonderful for me. I life n Brazil and in Fortaleza city today we had 32º. I would like to feel that snowning sensation. I think this beautiful mess missed us intentionally. Radar showed 45 miles in either direction having snow, and our family in Newport, RI got plenty, but here in dreary Harrisburg, PA – only rain. I would have been as happy as Mathilde had we gotten our share. Enjoy! This is shining! Where is Jack Nicholson?! Nice pictures! The silence of the snow speaks a language of its own. Thanks for sharing these beautiful pictures, Professor Roth. From an online student living in Brazil but not dancing Carnival. Enjoying your lectures instead. Thank you for sharing these beautiful pics… I was like saying “Lucky you” for all that snow (very rare here in Athens) but then I remembered that it was kind of a disaster for some areas. A propos… I mostly would like to thank you for the knowledge you are sharing with us through your lectures. Just enrolled for “Modern and Postmodern” and I think that’s the most precious gift I ever made to myself. You’re such an inspiring amazing teacher! I wish you the best for all your future plans. Hello teacher! I live in Brazil and here the climate is tropical and the heat is a characteristic of my city. One day I want to see snow, I think it should be a beautiful image of falling snow .. very poetic .. Big hug – Cristiane. Thanks for the pix. We still have family in CT. Am looking forward to stretching my brain in your course. One question. We had an old friend at Wesleyan that we have lost contact with. Is Neeley Bruce still there? Harder than I thought, but thought provoking. You are so generous to do this, for people unknown, results unknown. these pictures are really beautiful, well it must be freezing out there! it’s actually the same thing here in Batna Algeria i can’t go out i’m hibernating at home lol i just wanna say that i am really enjoying your class Mr. Roth looking forward to new lectures this week see you in class! Thank you , Professor ! This writing & sharing of instances keep us so well closer as Students , as Learners. It makes us feel part of our Teacher , our Instructor. Hello teacher, Thank you very much for giving us an experience of Wesleyan site. I am from India, Bangalore. There is no snow fall here. Than you for the wonderful lecture also. 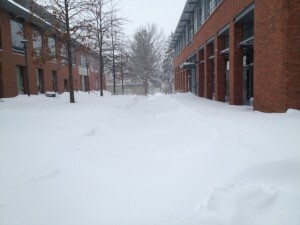 Nice pictures..How are you planning to remove the snow and go into your office.. Thanks for your online class, I am on of your online students. Ha, just like here in Finland where I live 🙂 Also, I am behind on reading ups…but I will do my best to catch up! Hi, thank you for posting these beautiful pictures. I’m an online student from overseas, republic of Georgia. Like your lectures very much. 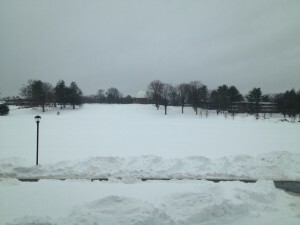 I miss the snow in Connecticut. I`ve been living in Portugal for a few years now, besides the tallest mountain in this country (that is located about 70 miles from where I live), it is a very rare sight. Yesterday I talked with family that lives in Farmington and I`m glad to know that power failures are`nt common. I have a degree in European Studies taken in the Universidade Aberta in Portugal and I had this subject seen very superficially in one of the classes. I like the theme and I´m looking forward to learn more. Impressing pictures! Here in the Netherlands we have snowfall too but not such huge amounts! Like you lessons very much!! 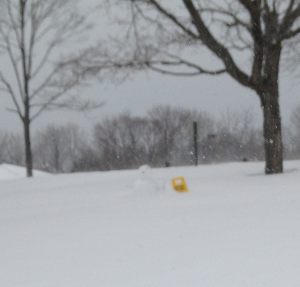 Enjoy and be warmed by a snowman, it is possible. Hello, Mike! Th pictures of snow are really wonderful, and so is the smile on Mathilde’s face. I’m listening with great satisfaction to your Coursera lectures. For the time being they are to me what I had expected and even more. Thank you for having done immense work of highlighting the most essential and putting simply super complicated things. Thanks for sharing these pictures.I really like there.It is snowing too in Northern Algeria ,the mountains are all dressed in white. Amazing photos, wonderful Mathilde! From your online student from the Republic of Armenia. Thank you for advice regarding the urge to critique and that to consider. And I do love the video lectures! Thanks for your pictures and sharing your and Mathilda’s experience. I am looking forward to lesion #2 as #1 has had my mind going all week. So many times I look around at our national news or just listen to my friends here in Northport and think of what Kant said and see the similarities in our worlds. I am also happy to see other students from so many other countries taking this course and wonder if their thinking is similar to ours here in NY and looking forward to discussions. You are a wonderful teacher and give much positive energy to what could be a dull subject matter. I am enjoying your course. 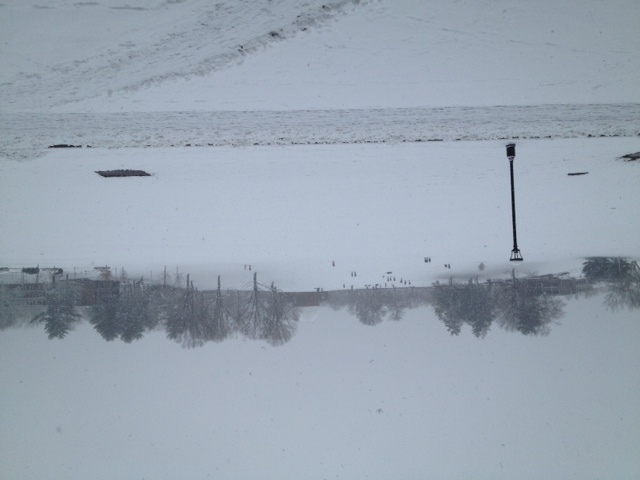 Michael, we had a similar snow-in at Wesleyan about this time in 1969. I flopped down Route 17 to pick up pizzas at a place that was somehow still open & tucked them into my jacket, leaning forward to keep as horizontal as possible. 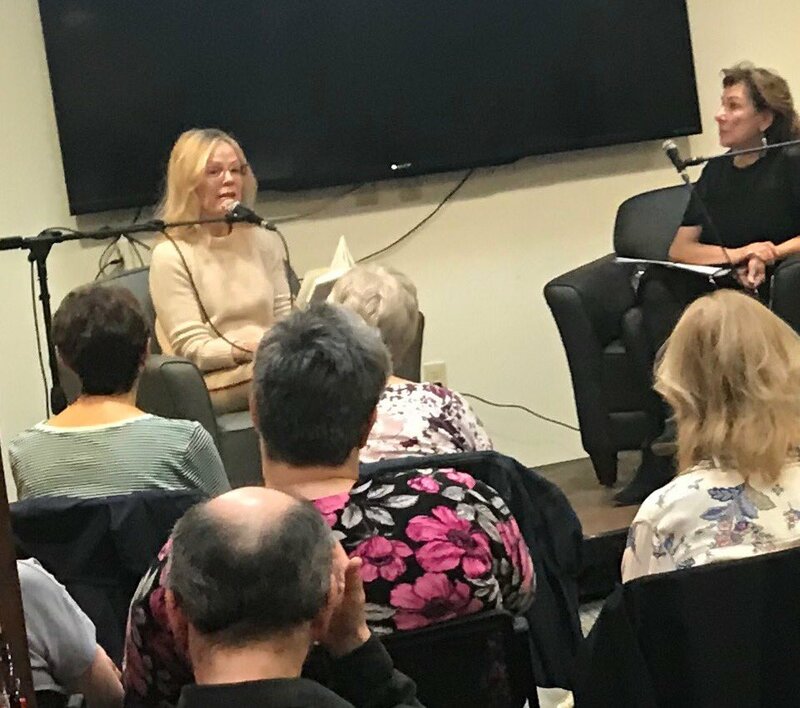 It was Winter Carnival at Dartmouth that weekend & we wondered about all the blind dates that didn’t work out, just waiting for Sunday, but now with a few more torturous snowbound days together. Beautiful pictures, beautiful Mathilda. I’m enjoying your lectures very much. Interesting is the contrasts across the worlds weather, in Australia one half of the country is on fire the other is flooded and the snow fall in the US matching our rainfall overnight of 2 feet. Dr. Roth, Thank you for sharing you teaching talent and amazing knowledge. It was a dream come true to find this course on-line, and at Wesleyan! We have about 40 cm. 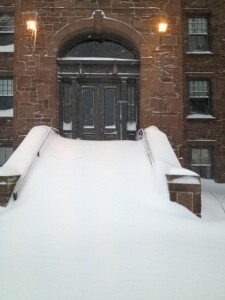 of white stuff here in Northern Nova Scotia (Antignish-home of ST F X University)-beautiful! nice pictures…I am a Srilankan. here we do not have snowfall season. I really enjoy this pictures. thank you. Thank you Prof Roth for sharing the great Pics. 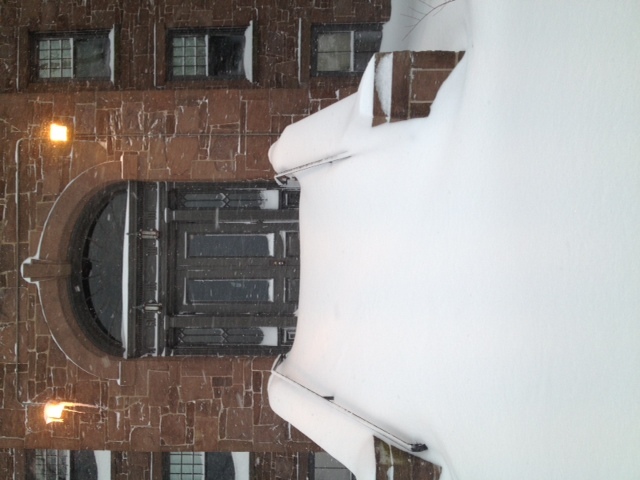 I received my Bachelors degree in Albany some 35 years ago and have great memories of being snowed in on campus. I am reliving some wonderful times through the eyes of Coursera and am very appreciative of your efforts in this particular course. I am now a Texan and miss the snow so much. We are having such a mild winter here, it is a bit scary, glad to hear the rest of the globe still has signs of real seasons. Now I need to look at this weeks video’s and catch up on my Rousseau readings. Can’t thank you enough for your time and hard work. I greatly enjoy your lectures! Thank you for the opportunity. I felt very smug after hearing what you said about Rousseau’s Discourse on Arts and Sciences, because you said a lot of the things I had though, including how quick and rather unsatisfactory the conclusion was. Love your pictures too. For some reason, here in Pittsburgh we only get the fringes of the blizzards and everything is gone in a couple of days, which is actually fine with me because, in spite of having been in the US 40 years, I still miss the golden sun of Brazil. Just a note to say how much I am enjoying the course having spent a couple of years studying scholastic philosophy in the seminary. I’m finally getting some use out of Britannica’ Great Books which have been collecting dust for years. Thanks for sharing the pics. Despite of the heavy snow you are experiencing still you have time to enjoy with it which what I really admire. Taking pictures and sharing it through online that we are getting aware also of what’s happening unto the other side of the world. 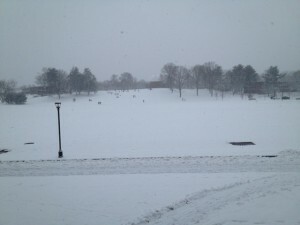 Hopefully I can go there and play with those snows. I’m from mainland China, a country caught up in litany of monarchy succession when enlightenment took place . Thank you so much for wonderful online lectures! am reading Kant now. Thanks Prof. Roth for sharing the photos. The sun has begun in earnest here and it is good to see the snow and feel the virtual coldness. Dear Professor,It was mice listening to your lectures..I am filled with the thoughts of Kant and Rousseau.. I am from India,a tropical country…lives in Hyderabad..It is winter here…but we had unexpected rains for the past two days and it has started to sunny again since yesterday..The pictures are so beautiful..very pleasing to see..so nice to share such experiences of geographical diversities..I wish to come and feel the beauty of the beautiful snowfall at the university…thanks a million for the lectures and the photos too.. Thank you for introducing us to your blog. Your classes are really interesting, fascinating actually, so are the recommended readings. As if it was not enough, you are a gift for the eyes!!! Best regards from São Paulo, Brazil.